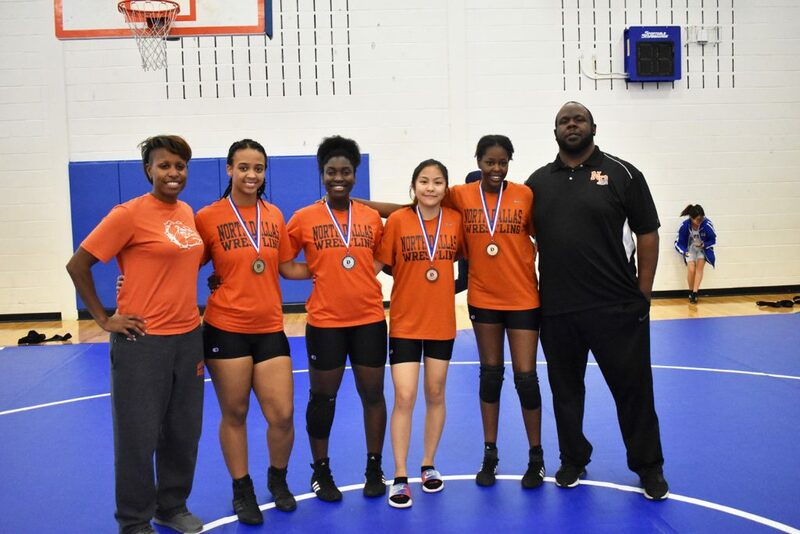 North Dallas coaches Desireé Allen (left) and Matthew Clay (right) stand with medalists Jayla McIntosh, Ladaysha Robinson, Holli Quach and Vivian Anthony at the All-City Meet last month. 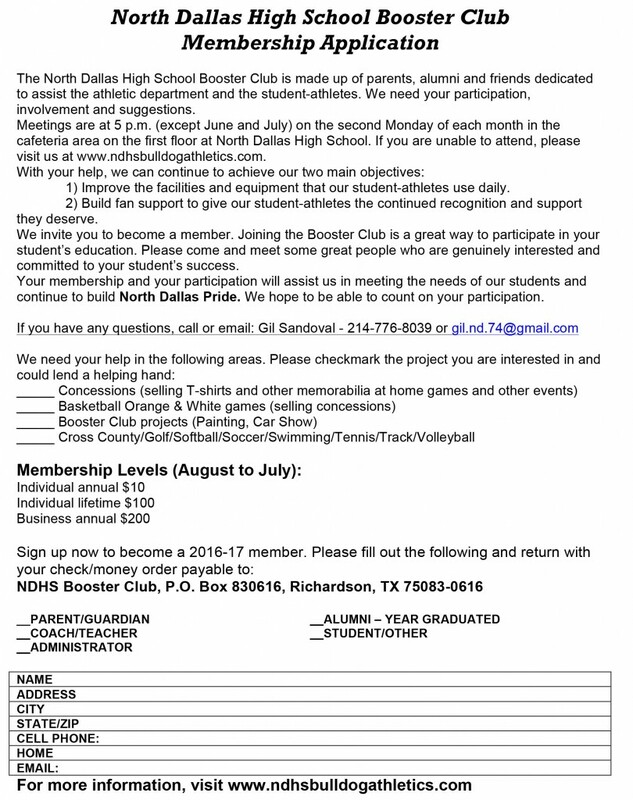 North Dallas wrestler Jayla McIntosh has been waiting for this opportunity. Jayla will be joining her North Dallas teammates at the District 14 meet on Thursday and Friday at Conrad High School. The meet starts at 6 p.m. Thursday, and goes all day on Friday. Jayla is one of the favorites in the 165-pound category. Jayla, who won the 165-pound weight class at the All-City meet last month, will face some tough competition. But she’s been practicing and she’s very confident. “It will be exciting. I can’t wait,” she said. 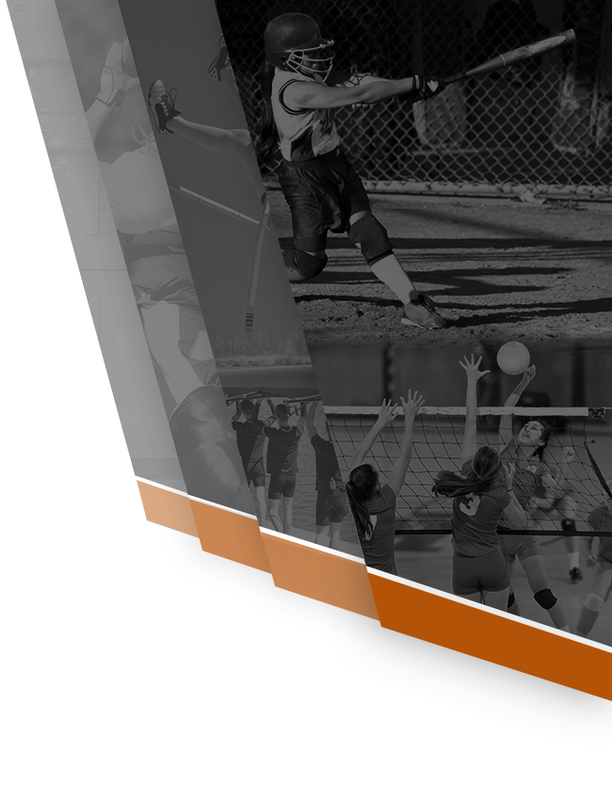 Jayla will be joined by teammates Ladaysha Robinson, Vivian Anthony (139) and Holli Quach (110). 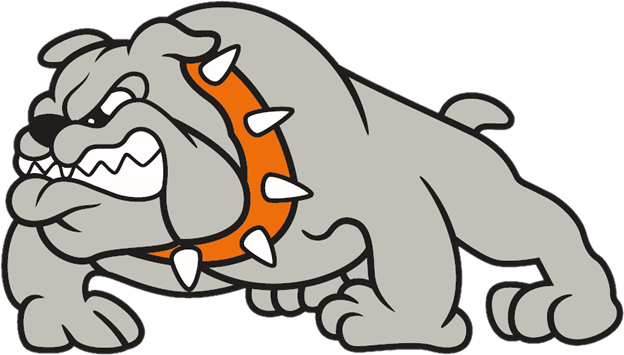 Ladysha competed at 165 weight class at the All-City Meet, but is trying to get down to the 150-weight class for the district meet. 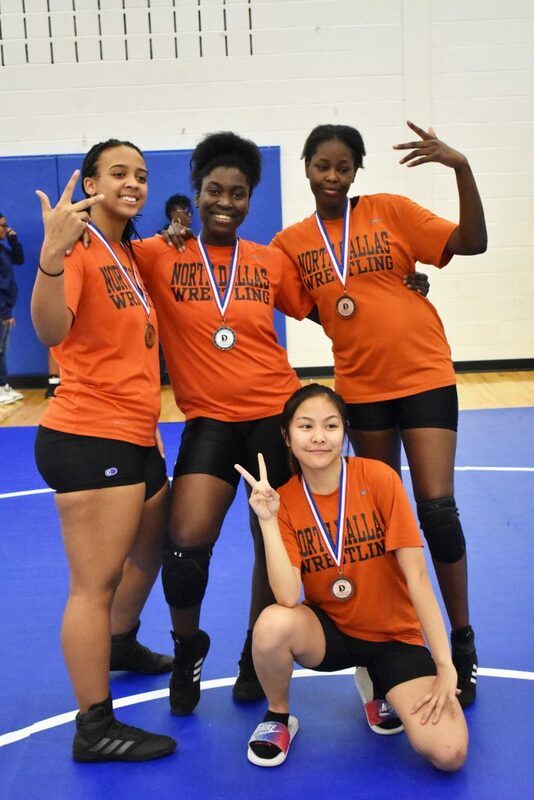 With only four wrestlers, the girls finished third as a team at the All-City Meet last month. The girls are very supportive of each other. 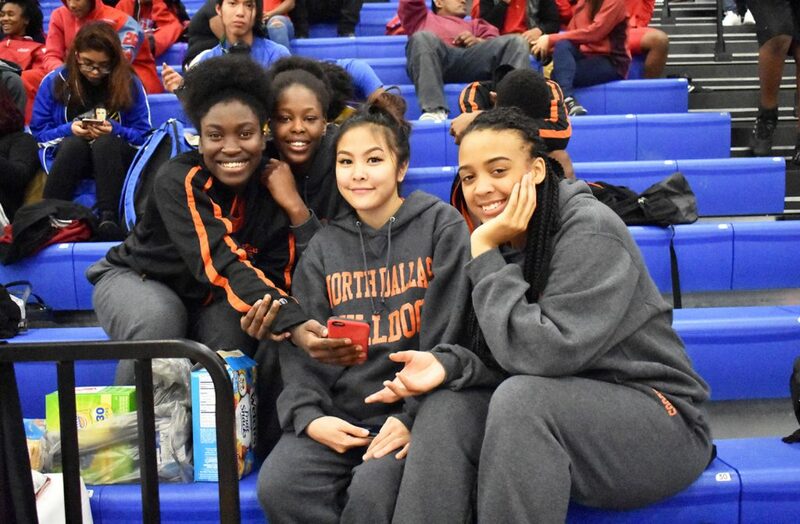 The North Dallas girls team includes Jayla McIntosh, Ladaysha Robinson, Vivian Anthony, and Holli Quach. 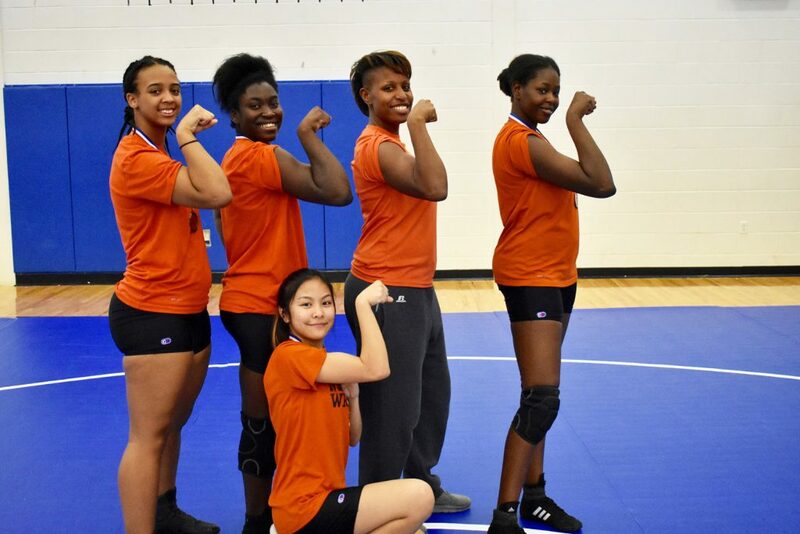 Jayla McIntosh, Ladaysha Robinson, Coach Desiree Allen, Vivian Anthony and Holli Quach. Ladaysha Robinson, Vivian Anthony, Holli Quach, and Jayla McIntosh wait in the stands.